People with missing teeth or non-implant-supported options have problems eating certain foods such as fresh vegetables and fruits, which can compromise their nutrition. Denture-wearing patients often lose some of their ability to taste foods. In addition, chewing can be difficult and painful so digestion is often compromised. Because dental implants function more like teeth, these offer the benefit of better health due to improved nutrition and taste, as well as proper digestion. Even the best made partials and dentures are prone to slipping and "clicking" if left unsupported. Business meetings, dining out and social activities become exercises in unpleasant suspense: Will my dentures embarrass me this time again? When a tooth is lost, the surrounding bone begins to shrink away or resorb and becomes increasingly brittle, compromising adjacent teeth and increasing the chance of a changed appearance. Non-implant supported dentures, such as partials or bridges, may actually accelerate this process. 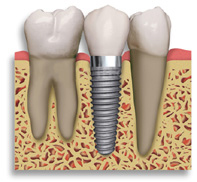 Dental implants may help to prevent or slow bone re-absorption, helping to preserve your natural facial contours.